An at-a-glance guide to the key points of the UK General Election night as they happen. With more than half of results in, the BBC has updated its forecast for the final result. 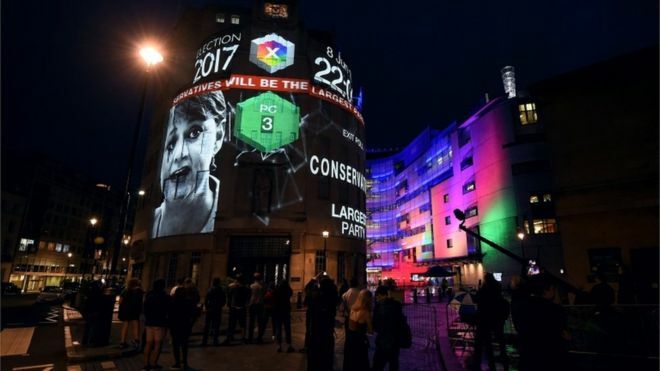 It is predicting 318 seats for the Conservatives, down 13 on 2015, 267 for Labour - up 35 seats, 32 seats for the SNP, a loss of 24 seats, the Lib Dems up three to 11 seats, Plaid Cymru remaining on three seats, the Greens on one, UKIP on none and 18 seats to other parties. It suggests the Conservatives will do slightly better than the exit poll predicted - but will still be just short of the 326 needed to have an overall majority. It appears Labour is doing better in areas where more than 55% of voters wanted to remain in the EU, with an average 8% swing to Labour in those seats, says politics expert Professor John Curtice. In contrast there is a 1% swing to the Conservatives in seats where Leave won 60%. The pound fell amid speculation over hung parliament - down 1.5% to 1.27 US dollars. Against the euro, the pound fell by 1% to 1.13 euros. Turnout is so far up by 3 points - it could still be below 70% by the end of the night, but looks as though it will be the highest since 1997. There is speculation that the SNP's Alex Salmond, Tory Home Secretary Amber Rudd and Conservative minister Ben Gummer may be in danger of losing their seats. Lib Dem Leader Tim Farron hung on in Westmoreland and Lonsdale after a recount with a majority of 777 votes. West Bromwich East: Labour's deputy leader Tom Watson re-elected with a majority of 7,713 over his Tory rival. Paisley and Renfrewshire: The SNP's 22-year-old Mhairi Black held her seat with 40.67% of the vote, despite speculation she could lose it. Prime Minister Theresa May, re-elected as Maidenhead MP with 64.8% of the vote, says "we have yet to see the full picture" but "this country needs a period of stability" and if the Tories have won the most seats "it will be incumbent on us to ensure we have that period of stability". 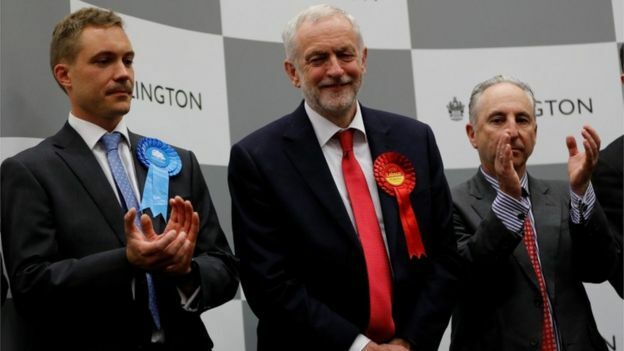 Labour Leader Jeremy Corbyn, on being re-elected to his Islington North seat, said "politics has changed and politics isn't going back into the box where it was before .. people have had quite enough of austerity politics". He said Mrs May should "go and make way for a government that is truly representative of this country"
Former Lib Dem leader Nick Clegg, on losing his Sheffield Hallam seat, warned of a "grave gulf" between young and old in the UK and said the next Parliament will preside "over a deeply divided and polarised nation" He said he had never shirked from political battles but as a politician, he says, if you "live by the sword... you die by the sword". Shadow foreign secretary Emily Thornberry says that if the exit poll was right, "it looks tonight like we could form the next government" and, if so, she said Labour would put forward a Queen's Speech and a budget and challenge other parties to support it. "There's no coalition, there's no deals. Either the Conservatives will be a minority government, if this poll is right, or Labour will be a minority government." International Development Secretary Priti Patel rejected suggestions Mrs May was wrong to call the election, saying "She made that call and she was very clear". Labour's shadow attorney general Shami Chakrabarti said the results so far were "a victory for hope over fear" and "democracy over terrorism" adding that people had "turned up in their droves" to vote. Former Conservative chancellor Ken Clarke says the results suggested Britain was on course for an "interesting parliament" but said he believed it would end with a small overall majority for his party. But another former Tory chancellor, George Osborne, tells ITV "there will be a huge post-mortem about having the general election, about the manifesto... about the style of the campaign" but he believes Theresa May will remain PM, if she wins a majority. 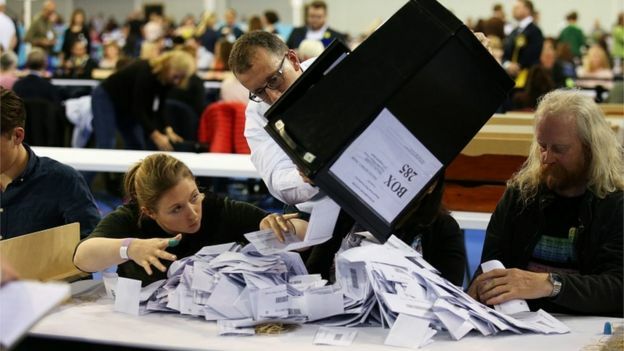 Former Lib Dem Leader Sir Menzies Campbell says it's too early to draw conclusions but, should the exit poll be borne out by the results, the PM's efforts to strengthen her Brexit negotiating hand with a larger majority have "exploded". 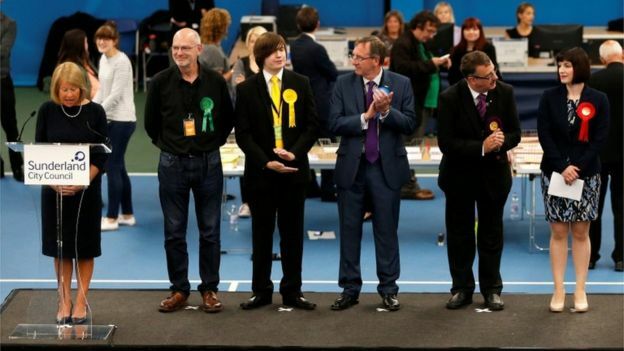 The SNP's Stewart Hosie, asked about suggestions the SNP could lose 22 seats, says it will be "some hours before this comes out in the wash" but says the real story, if the poll is correct, is that Theresa May appears to have "given up a majority" having called an election for "narrow party advantage". The DUP's Jeffrey Donaldson says his party will talk to the Tories in the event of a hung parliament adding: "We have a lot in common, we want to see Brexit work for the UK and for Northern Ireland we want to see the union strengthened." Green Party co-leader Caroline Lucas tweets: "Hardly dare hope this is right. To be clear Greens will never support a Tory government". The hashtag #HungParliament shot to the top of Twitter's list of top UK trends after the general election exit poll predicted that the Conservatives would lose their overall majority. More than 70,000 messages were posted in under an hour. The Cult of Curtice: Mild-mannered number-cruncher Professor John Curtice is a social media celebrity on a tense election night. If these numbers are correct, Theresa May played a high-risk political game and has lost it - she didn't have to call this election, and only did so in order to give herself a mandate and breathing space during the bumpy ride of Brexit. Just a few weeks ago at the start of all of this she seemed unassailable, but a shaky campaign and an insurgent Labour Party may have dashed the Tories' hopes. When the general election exit poll was revealed at 10pm, the pound immediately dropped by 2% as investors took a position that a hung parliament was a possible outcome of the general election. Why would that cause the currency to decline? Because a hung parliament means that the government's direction of travel would be less certain. 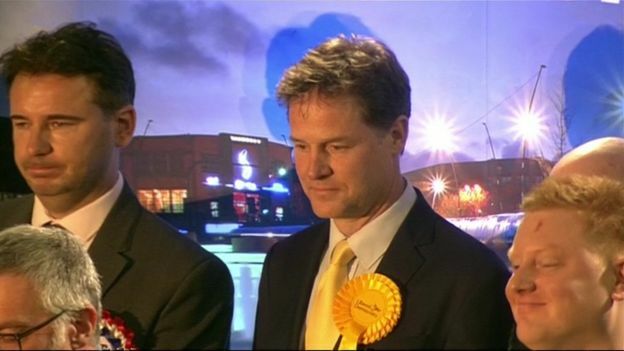 Image captionNick Clegg: "Live by the sword, you die by the sword"